Glaciers are becoming greener – what sounds here quite picturesque is a warning signal for the environmental status of our glaciers. With this saying we understand a coupling effect on supraglacial surfaces which has long been neglected in the awareness: Reflectivity (Albedo) is one of the key factors for the increase or decrease of ice masses. Albedo can be reduced substantially by organic or inorganic particles which absorb solar energy and contribute the warming of the surface. Supraglacial areas are also habitat for mainly microbial living communities such as bacteria, algae or fungi. Algae can protect themselves before damaging UV-radiation by darker pigmentation which results in a darkening of the surface which is increasing the availability of liquid water, hence again the growth of microbial communities. This biologically induced impact on albedo is called “bioalbedo” which has never been taken into account in climate models. So far we have most information on bioalbedo on arctic glaciers which is quite a shame that literally nothing is known about alpine glaciers. 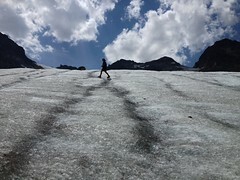 The aim of this interdisciplinary study is a quantification and qualification of organic and inorganic particles on an alpine glacier (Jamtalferner). Moreover, we aim to establish a non-invasive method called L.I.F.E. (Laser induced fluorescent emission) to quantify phototrophic pigments in high resolution. The collaboration will take place with two schools where the pupils will be able to join our experiments at university and will be supervised in their respective schools. Filed trips will be done together to the glacier in context with a mountain guide to assure safety. The adjacent refuge (Jamtalhütte) is also an educational center with a perfect infrastructure to teach and doing experiments. The hosts are supportive since this is the first attempt to define bioalbedo for the alpine regions where we can make the younger generation aware of.